The choice of clothing and equipment available to the General Aviation Pilot (GA) is enormous as is the amount of money that can be spent on all of those "must have" items! It is very tempting to go out and buy all of the kit that you see being carried about by other pilots without first considering whether you really need them or if they are appropriate to your personal requirements. What Clothing Do You Need or Want? Resist the temptation to "pose"! Don't dress up like Biggles when the other club members are in more appropriate clothing suited to the occasion! Your selection of clothing is determined to some degree by the type of aircraft that you decide to fly. Have a look around the club and see what the other pilots, who fly the same type of aircraft that you are learning to fly in, are wearing. Talk to them about their choice of clothing and find out why they have made that choice. Whenever possible try on and use a set of clothing owned by the club or borrow it from a friend or fellow pilot to see if it is right for you before making a purchase. If, for example, you decide to fly open cockpit Microlight aircraft then you would probably want to consider buying a protective helmet, gloves, boots and thermal suit. You may decide to fly an open cockpit aircraft such as the Tiger Moth where a Nomex Flight Suit, protective goggles and leather helmet are more appropriate.The enclosed cockpit pilot who typically learns to fly aircraft such as the Cessna 152 or Robin R22 may fly, depending on the weather, in everyday cloths such as jeans and a tee shirt! What Equipment Do You Need or Want? Pilots Log Book - sometimes given to you by the club after your trial flight when you agree to continue training with them. Training Manuals - A large choice of these in DVD/CD or paperback format can be purchased from your club, aviation magazines and the Internet. 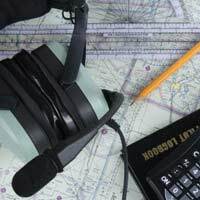 Navigation Tools - Try and buy those that are recommended to you by your instructor so that there is continuity to your training. Knee Board - An essential item to keep your flight plans to hand as well as a pen and paper to write down any instructions or notes given to you from the ground during flight. Appropriate Up to Date Aviation Map - used for planning and practicing your navigation techniques. Don't forget that it is a legal requirement to fly with an up to date map! Flight jacket, Flight Suit, Flight Helmet, Flight Goggles, Scarf, Gloves, Boots, Baseball Cap, High Visibility jacket, Sun Glasses. Flight Bag, Headset, Headset Bag, Global Positioning Systems (GPS), Stop Watch, Air Band Transceivers, Personal Location Beacon, Lifejacket, Flight Computer, Traffic Alert and Collision Avoidance System (TCAS). As you can see there are those items that you simply cannot do without and there are those that are desirable or simply make it easier and safer to fly. Before purchasing any clothing or equipment it is best to talk to your instructor or fellow pilots who already use the type that you are considering buying. Ask them why they made their choices and if given the chance would they make any changes? Don't forget to look on the club notice boards for nearly new items that were purchased in error and are now being sold at bargain prices!